This has been a fun project. 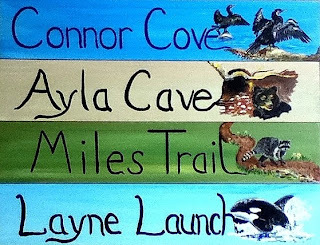 I just finished four more signs for my dear friends that live in a beautiful location on Puget Sound. 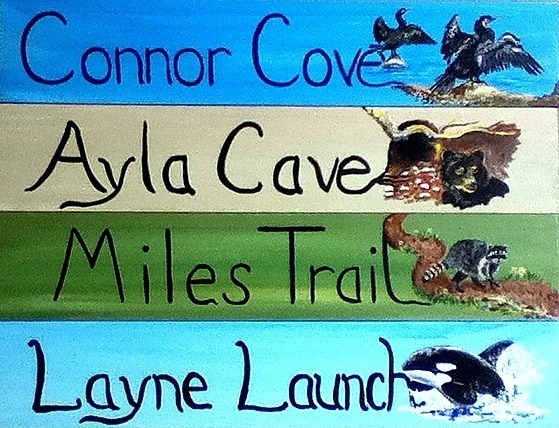 Over the past 6 years, I have completed a number of these nature signs for their property including an ecosystem for each of their grandchildren. What a great idea for the 'grandparents who have everything'! Each sign is cedar which I sand, brush with gesso, then paint the lettering, flora & fauna and lastly varnish. My friends use eye hooks and chain to connect the signs outside under the porch near their door for everyone to view. They have lasted 6 years (the first ones) and still look crisp and colorful. Fun Project! These signs include: cormorants, black bear, raccoon and an orca. All of these animals can be viewed around Puget Sound. We have had a black bear in our compost. Last year one just walked down the dirt road in front of our house. Biggest 'dog' I've ever seen!